Every culture enjoys a good cheese sauce and most cuisines proudly boast their own version. This salsa de queso recipe is a Latin American treat. Enjoy it as a dip with tortilla chips or over eggs, macaroni, potatoes or your favorite vegetables. Whisk in the flour and salt, then whisk in the milk. Turn the heat to medium and stir continuously until the mixture thickens. Reduce the heat to medium-low and add the cheese a little at a time, stirring continuously until the sauce is smooth and creamy. Pour the hot sauce over eggs, macaroni, potatoes or your favorite vegetables. If you're using the sauce as a dip, you can give it a nice crust by putting it under a hot broiler for a minute or so. Place it in a heat-resistant serving bowl. It'll need to withstand high temperatures even if just for a short time. Substitute American cheese in place of the cheddar or try a combination of cheddar and Monterey jack cheese. Keep in mind that if you use American or another processed cheese, you'll run the risk of the dip hardening after it's served and it cools down to room temperature. You can substitute beer for the milk, but cut the quantity to about 1/2 a cup of beer. Test the consistency of the cheese and add more beer in increments if necessary. If you decide to use beer, heat it to boiling first, then reduce the heat to low and add the cheese and other ingredients. Take care not to boil the mixture a second time. Try a variation on the taste of the dip by substituting half a 14.5-oz can of crushed tomatoes for the milk. Use the sauce for nachos. Place chips in the bottom of a baking dish and add the salsa de queso on top. Bake for 8 minutes at 350 F, then pop the dish in the broiler for an additional 2 minutes. You can add hot peppers or green onions to the top after baking, and serve with guacamole or sour cream. This version of salsa de queso is on the mild side. Add diced green chilies if you like a spicier kick, or top the finished dip with jalapenos if you and your guests prefer some significant heat. 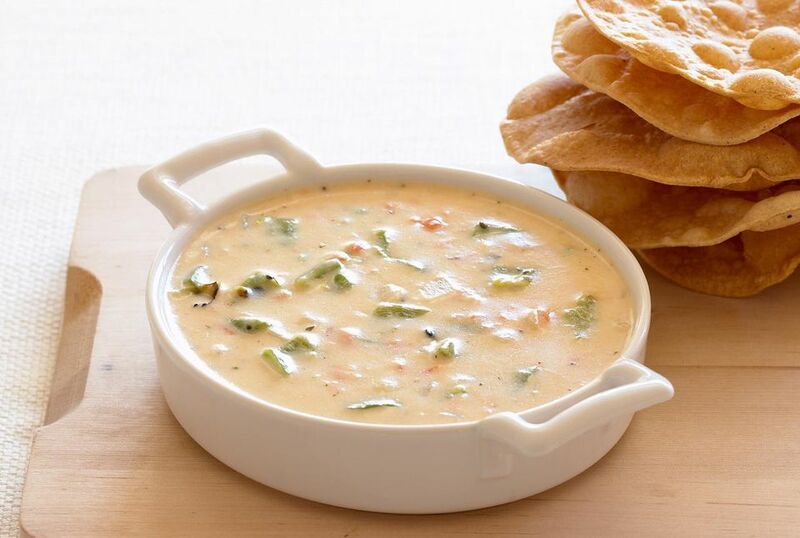 Some recipes for salsa de queso add a touch of minced garlic, minced onion, or cilantro. Sauté the onion or garlic in the melted butter before you add the salt and flour, or add the cilantro, or other dried spices of your choosing, to the salt and flour.